Amazon Smile makes donating to B the Difference even easier. Amazon Smile will donate 0.5% of the price of eligible purchases to your favorite charity. Your generosity will help us to continue to help those who need us most. Next time you go to Amazon, add smile. before Amazon and log in with your regular Amazon account. 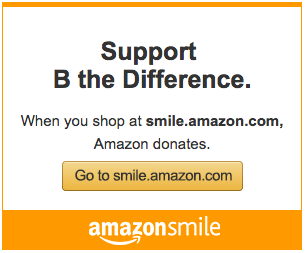 When prompted search for and select B the Difference and every time you make a purchase Amazon Smile will donate to us!